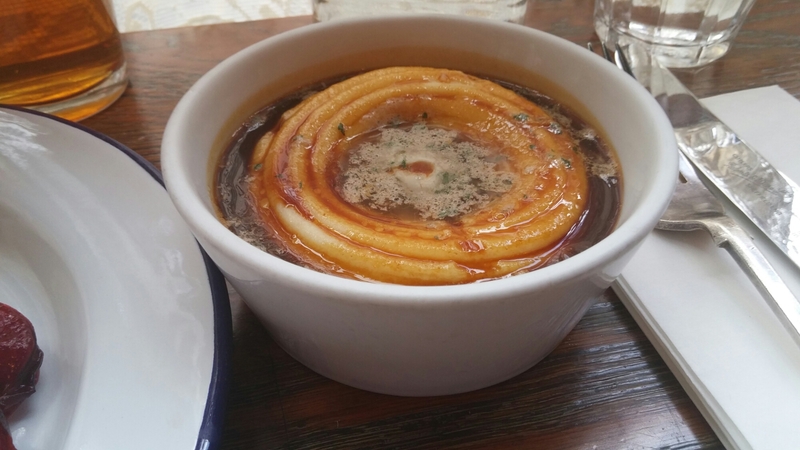 Marvellous Mangalitza and mega mash – Pitt Cue, Soho, London UPDATE – Moved to 1 The Avenue, Devonshire Square, London, EC2M 4YP. On a business trip to London, I had a couple of hours to kill between the end of my meeting and the train back home I had a reservation on. 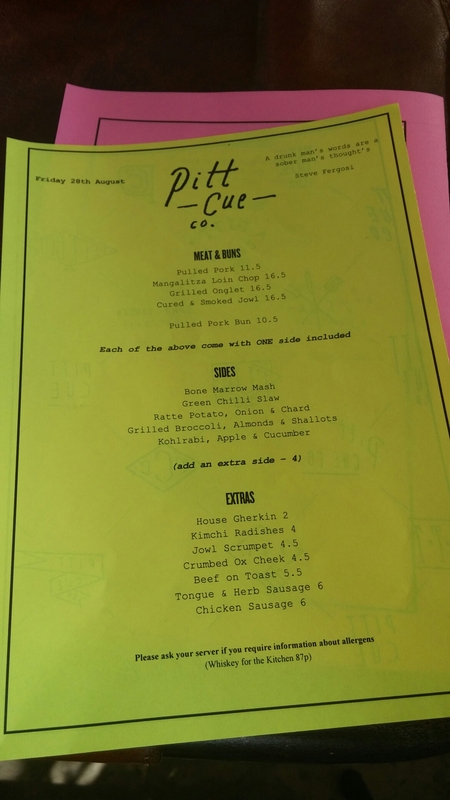 I, therefore, took the opportunity to tick Pitt Cue, a BBQ and meat lovers paradise in Soho, off my rather long list of foodie places to visit in London. 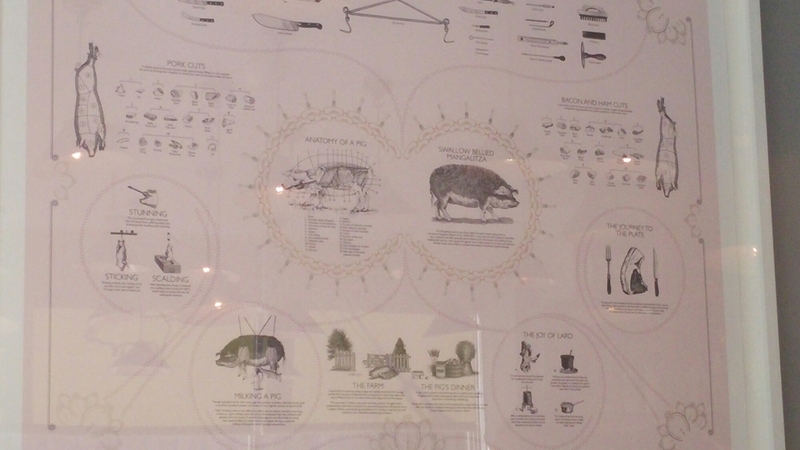 One of the reasons I had wanted to visit Pitt Cue was the fact that they have on their menu Mangalitza pork. This stuff comes from the Hungarian Mangalitza pig, which is a curious beastie, having a full coat of curly hair (usually blonde, but can be ginger or black). Think a “pig in sheep’s clothing”. Mangalitza is up there with acorn fed black foot Iberico pigs as piggie royalty. It is renowned for its fat levels, with the fat to lean ratios being 50%+ (I may well have some Mangalitza in my DNA on this basis). This compares to a fat to lean ratio of 30% or less for your normal porker. Beloved of charcutiers, the plentiful buttery fat on a Mangalitza makes it perfect for salamis etc. Due to the Mangalitza’s heavy fat content and the marbling of the meat, it has been called the Kobe of the pork world. 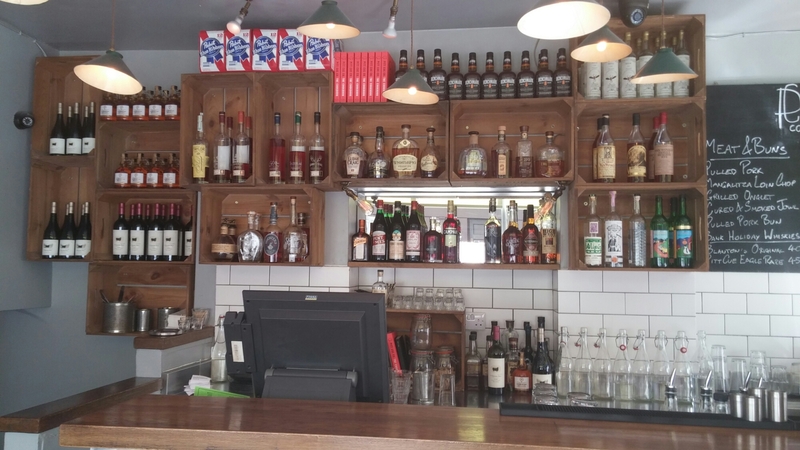 I was keen to try it, to see if it lived up to the hype, and Pitt Cue is one of the place to get it in London. 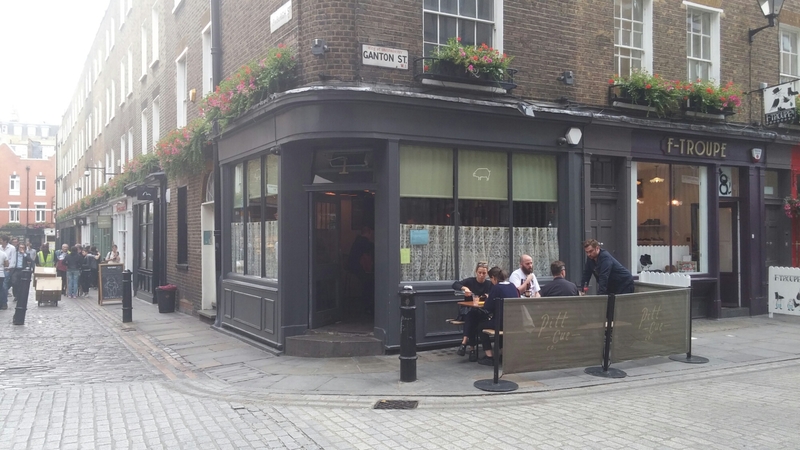 Situated on the corner of a street running parallel to Carnaby Street in Soho, on the outside it is “unassuming” personified with no name and merely a pig logo to signify its presence. The inside is shielded from prying eyes by some rather twee net curtains. The entrance leads you into a dinky bar area, with sitting by the bar and around the walls for a max of (I would say) 10 people. There is a downstairs basement restaurant area which I didn’t get to see, as I was seated in the bar area. The bar was what I would describe as spit and sawdust. Nothing fancy and purely functional. I like that in a place selling meat. It seems to be a bit of a hipster haven, with trendy music (at a volume a little above my preferred level), and I did feel somewhat out of place having a suit on and being facially less than hirsute (lacking a beard which, if male, appeared to be manadatory wear here for staff and customers). I was half expecting to be told a table would only become available once I had grown a suitably resplendent beard. The waits for a table in the evening are apparently of epic proportions, so it may be that in the evening a beard is grown before you get a table. On a Friday afternoon during lunch service, I however walked in clean shaven and was seated immediately. including the only thing (based on the post title) I was ever going to go for in the form of the Mangalitza loin (£16.50, with one side). 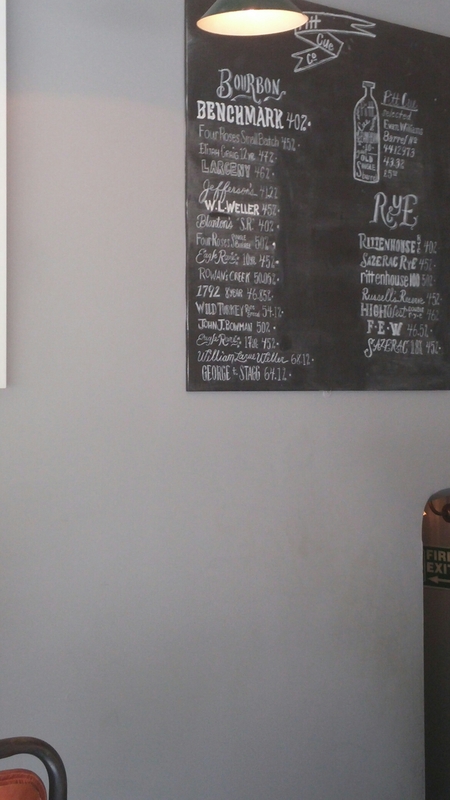 I could have ordered everything on the short lunch menu, with the smoked jowl top of my list for my next visit. The diner next to me was tucking into an onglet (hanger) steak and others in the bar area the pulled pork. Both looked delicious. The Mangalitza loin, true to form, was fat heavy with about a 50:50 ratio of fat to meat. The fat had a lovely butteriness to it that melted in the mouth, whilst the meat was super juicy with a great flavour. It actually tasted of something, unlike most bog standard pork. To me there was a lovely nuttiness and herby flavour to the meat that worked beautifully with the buttery fat. It came with a great Mangalitza patty and some sour mirabelle (I think) plums. The patty was jampacked with porkiness (trotter meat I think they said ). Added to this was a slick of glossy, meaty sauce (their “Mother” sauce” I believe – more on this later). 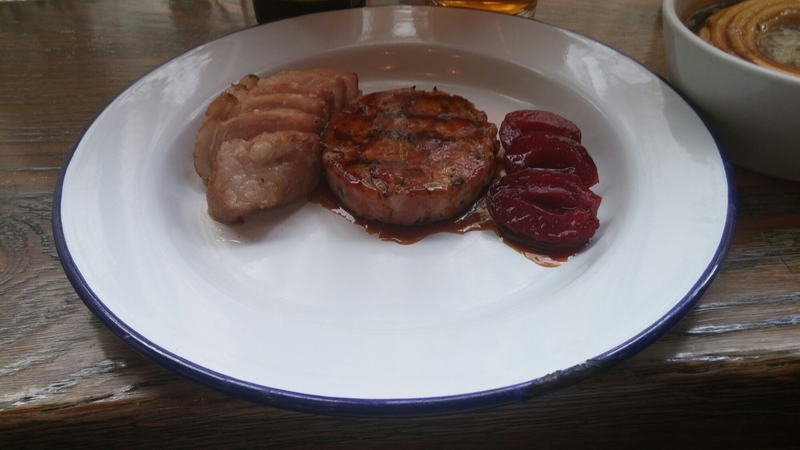 As against the richness of the patty and the Managlalitza loin, the sourness of the plums provided the perfect foil. A cracking dish that I really savoured eating and which lingered on my taste buds long into the day. Each main comes with one side as part of the price (it is then £4 for each extra one you order) and I immediately went for the delicious sounding bone marrow mash. Mrs. SF and I agree on many things food wise, but mash is not one of them. She likes a bit of texture to her mash, whereas I prefer the “French style”, with lashings of butter, potato puree. Pitt Cue’s mash is pretty close to what I regard as potato perfection. It was as smooth as a baby’s bum and wouldn’t know a lump if it bit it on said bum. To this pureed potato had been added copious amounts of double cream and butter. Perfectly seasoned (I hate under seasoned mash) with beefy whipped bone marrow (the marrow plus lemon juice, garlic and salt and pepper – all blitzed in a blender) which had dissolved into a slick floating, with Pitt Cue’s Mother Sauce, on top of the mash. Pitt Cue’s “Mother Sauce” is an absolute dynamite beef sauce that exhudes meatiness and umami savouriness. It and the whipped bone marrow turned the mash from what would have been merely awesome to legendary. I once scoffed (and successfully predicted its very short life) at the concept of a mash potato takeaway in Cardiff (think it was called Fab Mash), but I would eat Pitt Cue’s mash for breakfast, lunch and dinner 7 days a week, eat in or takeaway, if I could. It really was that good. As Mrs. SF wasn’t with me, I had no one to tell me off for using my finger to scrap up every last vestige of the mash from the receptacle it came in. My only complaint was it didn’t come in a trough. In addition to the sides, there are also extras which can be added to your meal. These range from £2 for the house gherkins to £6 for the tongue and herb sausage. I particularly liked the sound of the “jowl scrumpet” and the “crumbed ox cheek” (both £4.50 each), but deemed my Mangalitza and mash combo enough for lunch so passed on an extra. Whilst I love the smell of bourbon, it doesn’t agree with me and it was a hot day, so a beer was in order. 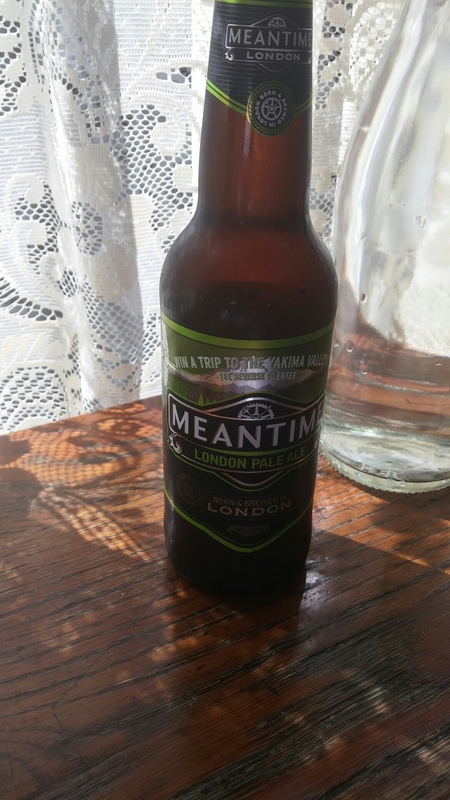 and after a bit of indecision, I finally decided on a bottle of London Meantime Pale Ale (£4.50). This had a nice hoppiness, as well as grapefruit flavours, to it. This made for a very refreshing drink that worked nicely with the pork and mash. 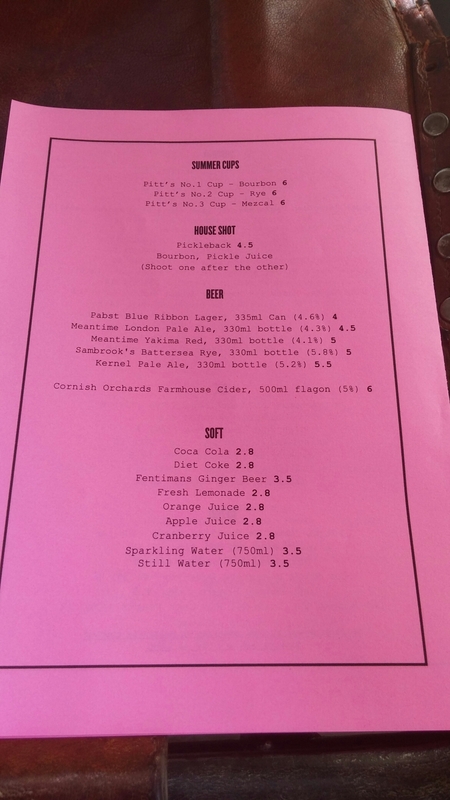 A decent enough selection of soft drinks is also available and a bottle of still (tap) water was provided at no cost and without me having to request one. I think you can probably tell I was somewhat enamoured with Pitt Cue. The food may not be fancy pants looking, but boy does it taste good. which included a slightly annoying automatically added discretionary service charge. I would have tipped generously anyway, as the service was very good, but I don’t like it being added like this (especially with all the current controversy as to where tips actually go – Pitt Cue I would add are not one of those places that disgracefully don’t pass tips on in their entirety to their staff, as far as I am aware). Whilst not cheap for lunch, I thought it good value for the quality of the ingredients and the cooking. The website is very basic, so if you want menu details check out their Twitter account feed @pittcueCo or Facebook page. The place opens 30 mins before and closes 30 mins after kitchen opening/closing times. No bookings are taken, so it is just a case of turning up and hoping for the best. 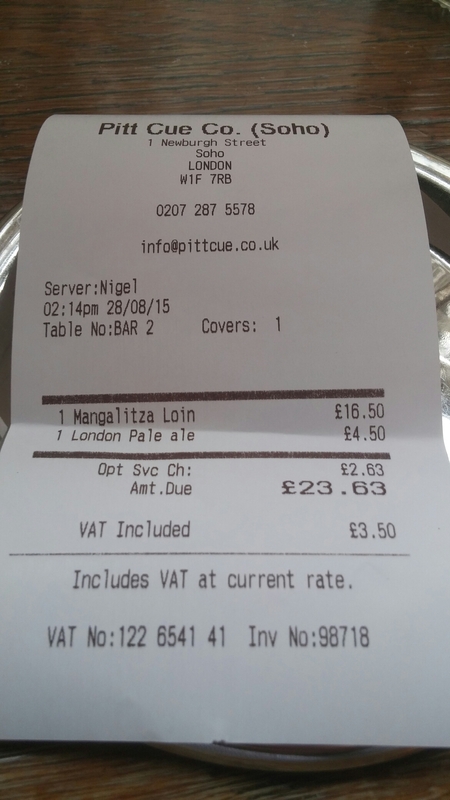 This entry was posted on Sep 13, 2015 by solicitingflavours in BBQ, Beer, craft beer, Drink, Food, Hot smoking, london, lunch, lunchtime, Mangalitza, Outside Wales, Pitt Cue, Pork, Real ale, Restaurant Review, review, sausages, Smoker.